Let us now praise Susanna Phillips. The young American soprano, a native of Birmingham, Alabama, now increasingly a citizen of opera and concert hall stages around the world, gave a vocal recital Saturday evening at Jordan Hall that could serve as a seminar in how and why such a program works. Organized on a timely theme, women in life and love, it was conceptually cohesive, creating a whole that was made up of but greater than its individual parts. 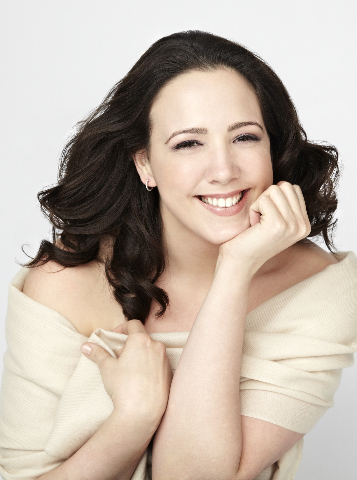 Singing roles in operas ranging from Handel (“Agrippina”), Mozart (the Countess in “Le Nozze di Figaro”), Puccini (Musetta in “La Boheme”) to Kaija Saariaho’s “L’Amour de Loin,” a recent triumph at the Met, Phillips is, on the evidence of Saturday’s concert, that rare opera star who is also a first rate recitalist. What made the evening such a delight was Phillips’s voice. At an early height of her vocal maturity, Phillips has a flexible and fluent instrument that shows no strain across the registers. She has a full, rounded, silvery sound with plush top notes – the soprano ideal – and she sang with perfect breath control and dynamics. Although canary fanciers would have been pleased by her performance, Phillips is more than a sound machine – she used her voice for expressive purposes, and she sang the texts of the songs with clear enunciation, endowing them with an importance that made you realize why the composers chose them in the first place. She is above all a good story-teller in music. It felt like a privilege to be in the audience. The singers’ art is so evanescent – it’s here today and gone tomorrow - it’s rare that it all comes together the way it did Saturday night. The recital opened with three songs by Schubert. The familiar “Gretchen at the Spinning Wheel,” to a text by Goethe, was the most impressive, the rolling chords of the piano evoking the spinning of the wheel that built over its length in a slow crescendo. In these songs, Phillips laid out her cards – vocal purity, tonal clarity and expressivenessThe center piece of the first half of the concert, indeed of the entire concert, was Schumann’s great song cycle “Frauenliebe und –leben” (A Woman’s Loves and Life), which gave the concert its conceptual hook and title. A suite of eight songs set to texts by Adelbert von Chamisso, it traces a woman’s love from giggly infatuation to maturity, marriage, motherhood and the early death of her husband, the full range of emotions a woman might experience in a life delimited by its relationship with a man. The poetry and the music are entirely sympathetic to the woman experiencing the extremes of love, but the strophe in the poem, “Ring on my finger,” which goes, “I will serve him, live for him/Yield to him and find/Myself transfigured in his light,” reminds you that both words and music are by men, and that it might be difficult to find a pure feminist text in the mid-19th century. Phillips traversed the songs with the appropriate emotions for each. She started out with full girlishness; in the third poem, “I cannot grasp it, nor believe it,” the protagonist gushes “I am in the spell of a dream/How, from amongst all, has he/Raised and favored poor me?” which Phillips sang conversationally as if it were a feverish entry to a teenager’s Facebook account (or whatever platform is in favor at the moment). She concluded the song with a big smile – did I mention that Phillips has a radiant smile? Another sort of love is expressed with the arrival of a child – her child at her breast, the protagonist sings, “Happiness is love/Love is happiness.” But happiness does not last long in the 19th century, indeed at any time. In “Now you have caused me my first pain,” the protagonist laments her husband’s death with anger, “you, harsh, pitiless/man are sleeping/The sleep of death,” before she accepts that her life is now a void - “I am living no longer.” Phillips delivered the song with the beauty we grew accustomed to hearing from her, but with the full heartbreak of the fact that the protagonist is losing her soul mate, too early in her life. She concluded with her beautiful face dissolved into the grief she was expressing musically. Huang brought us down gently in the extended solo piano coda that brings to work to its conclusion. Renée Fleming sang this same cycle a couple of years ago at Symphony Hall – it has become a popular work with women who are trying to deal with being women in today’s world. But although she was to be commended for trying something outside her comfort zone, her performance was a failure, especially when compared to Phillips’s. It was disjointed, a series of separate songs, rather than one statement divided into parts. Fleming sang from the score, suggesting she didn’t know the texts; the devastating cumulative effect the songs create was undercut by her delivery. I’m not bringing this up to dump on Fleming, who is one of the great sopranos of our age, but to point out how successful Phillips’s performance was, and how difficult it is to properly deliver a song cycle. Singing such works, which occupy the pinnacle of the lieder literature, requires study, work and commitment. A beautiful voice is not enough. Aragon) to the joyful (Jane Seymour who died after childbirth) to the defiant (Katherine Howard and Anne Boleyn). The music changes its cast as the texts do, but even with that variety, Larsen fails to give these final words the life they deserve. The natural work to compare them to is Peter Maxwell Davies’s “Eight Songs for a Mad King,” a song cycle set to the words of King George III during his final craziest days. If done as it should be, the Maxwell Davies is a real tour-de-force for the performer. Larsen’s songs are too well behaved in that Midwestern way to rise to that level of intensity. (Of course, none of the women were insane, a couple were just facing their executions.) Phillips did the songs their due, and she also did her due to composers of her gender, who are under-represented in the concert hall, by programming them. But it made for a weak ending to a strong concert. Until that is, the encore. Even as she demonstrated her deep understanding of the vocal recital, Phillips was willing to subvert or in trendy terminology, “disrupt” its expectations as well. There was, for instance, no costume change at intermission, something which would be unthinkable for diva-minded female singers like Fleming and Deborah Voight. How refreshing! Phillips looked stunning in the first half of the program and she didn’t see any need to change just to evoke a few “aahs” at her entry after intermission. And instead of another song from the standard repertory – a Strauss song, for instance, or maybe Musetta’s waltz scored for voice and piano – Phillips chose a contemporary oddity, Gordon Myers’s “Do You Sing, Mr. Twain?” a collection of 42 songs set to words, many one-liners, by our original late-nite talk show host, Mark Twain. She sang only eight of the 42, but they were just enough. Starting, she said to the audience, “Enough of the seriousness,” and launched into the unexpected - and delightful. I’ll quote just one – in its entirety, “Wagner’s music is better than it sounds.” OK, another: “Chastity can be carried too far.” All were not so brief. The final song was given full ABA baroque opera aria treatment, and it was, at least for this opera-savvy audience, a hoot. Now, that’s the way to end a concert. The last time I encountered such saucy wit was in 1980, when Janet Baker, after delivering a very very serious program, returned with “I Love My Voice,” a ditty that brought down the house, the house being Symphony Hall. Phillips is one of the most promising young sopranos on the world’s stages today, and we in Boston, not one of the major opera centers of the world you might have noticed, have been lucky enough to hear her in her prime more than once. She had a tiny role in Boston Lyric Opera’s unfortunate production of Benjamin Britten’s “A Midsummer Night’s Dream” a couple of years ago, and she brilliantly sang the title role in Boston Baroque’s “Agrippina, “one of Handel’s naughty comedies, just last season. Mark down this date: April 21. Phillips will return to Boston Baroque to sing Cleopatra in Handel’s “Giulio Cesare in Egitto.” The opera is arguable Handel’s greatest and Cleopatra has a half dozen of the most rapturous arias ever written for the soprano voice. It will be done on April 23 as well, so maybe you ought to think about buying tickets for both nights.